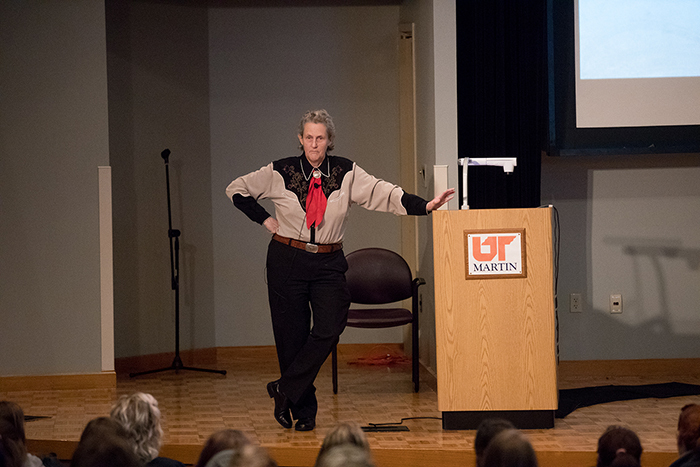 MARTIN, Tenn. – Dr. Temple Grandin, an internationally-known animal behaviorist and autism advocate, spoke Feb. 13 at the University of Tennessee at Martin. Her presentation, titled “Developing Individuals Who Have Different Kinds of Minds,” was sponsored by the Ed and Llew Jones Distinguished Lecture Series. Grandin focused her comments on the value of individuals who see the world differently than those around them, such as those on the autism spectrum and those with other learning difficulties such as dyslexia. “We’ve got to help the minds that are different succeed. We need these minds that are different, and we must not screen them out because the world needs all kinds of minds,” she said. Grandin gave examples from her own life to illustrate the need for creative classes such as woodworking, welding, sewing and theater in schools. She has invented many restraint systems and handling facilities for the livestock industry, and those pursuits began with an early exposure to construction and art. Her presentation is available through archived video on the OVC Digital Network. Click here to view. The Ed and Llew Jones Distinguished Lecture Series was originally created in 1989, and Grandin is the 15th speaker in the series. The program was recently reinstated in part by Meg Kinnard Hardee, the only granddaughter of former Congressman Ed Jones, and her husband, Geoffrey Hardee, in honor of Meg’s grandparents. For more information on Grandin’s appearance, contact Dr. Emalee Buttrey, assistant professor of animal science, at 731-881-7255 or ebuttrey@utm.edu, or Sara Rachels, Paul Meek Library, at 731-881-7083 or srachel1@utm.edu. PHOTO ID: Dr. Temple Grandin is a professor of animal science at Colorado State University and an internationally-known animal behaviorist and autism advocate. She is shown speaking to individual student courses before her public evening presentation.